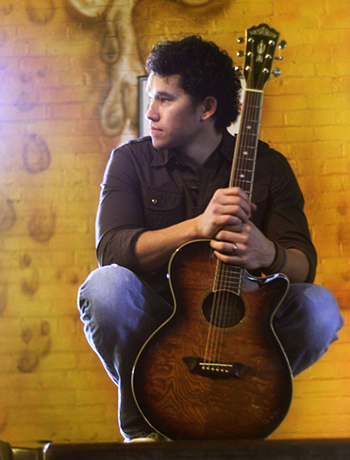 Don Amero In the fall of 2007 Don quit his day job of hardwood floor installer and began pursuing music as a full time career. So far so good… Growing up in the North End of Winnipeg, acoustic musician Don Amero has definitely faced his share of adversity. With poverty, gangs, drugs and violence as daily reminders of the harshness of the world, Don’s life was nevertheless tempered by love, support and the knowledge that a Greater Power was intimately involved in his life. Shaped and moulded by his coming of age, his music now carries both the depth of experiencing hardship and the luminosity of experiencing hope. All who have the pleasure of listening to his music will no doubt leave with his encouraging and positive message lifting their spirits. Don was honoured with two recent awards Aboriginal Songwriter of the Year at the 2009 Canadian Folk Music Awards and Male Artist of the Year at the 2009 Aboriginal Music Awards. IMAGO: How were you first drawn to music? DA: My parents were both musicians, my dad played bluegrass guitar and my mom sang. I think watching and hearing them play amongst their friends showed me how music could be a a way to have fun and build community at the same time. IMAGO: You spend al lot of time on the road performing. Do you have time to write? DA: Not as much as I’d like. Because I’m an independent artist and manage my own career, the creative process suffers a little bit. Now it seems more like I have to allot time to be creative. However, I still find when I do sit down with Rosie, my guitar, I’m still very easily inspired to write music based on what is happening in my life. IMAGO: Your move to be a full time artist was a risky one – what led you to make that move? DA: I felt the time was finally right, I had been thinking about it for a long time and had already spent the previous four years working part time as a musician and found that it could no longer be confined to a part time job, but that if I was going to have any success, I would have to give it more time and energy. I think one of the biggest reasons was that I realized I was unhappy doing anything else and looking back on it now, I haven’t regretted a thing since making the decision to go full time. IMAGO: What do you want your music to do for those who listen? DA: I’ve always said, “I hope my music inspires and encourages people to do good things for themselves and for the world around them.” I’ve also found, over the past couple of years I get a lot of responses from people who’ve found comfort and healing in my music, which is easy to understand as most of my songs come from sensitive or challenging issues that can be hard to deal with, and I can imagine it’s nice to have some music on your ipod that is encouraging. IMAGO: What is your view about the connections between art and matters of justice? DA: I think that art is a persons way to express their feelings towards justice. Also, through art, people can be inspired to do the right thing and I guess, for that matter, they can also sometimes be inspired to do the wrong thing… I definitely believe that art has power. IMAGO: How does your faith influence your art? DA: My faith is integral to every area of my life, and when it comes down to it, my core beliefs – love, respect, truth, honesty and encouragement are what I try to pass on through my music whether it’s heard from festivals, to churches to bars. I love that fact that I can play a song in a church on Sunday morning and play the same song in a pub the next week with a great response from both audiences. My heart has always been to take what I’ve been given and use that in any situation to sir up a fire in people to do whatever it is that they love to do.